I am not updating this script any longer. I don’t really participate in the flickr awards/voting groups as often as before, so please do not ask me to add your group codes. I recommend the SICI script, also based on the original SIC script. This script is customizable so you can choose only the groups you need, and leave out the rest. I have been using both my SOS script and the SICI scripts. Two menus appear, and I use them both. I like having a few extra groups from the SICI script, and it has been working fine! What is SOS – Invites & Comments? The SOS – Invites & Comments is a special Greasemonkey script for Firefox browser users. 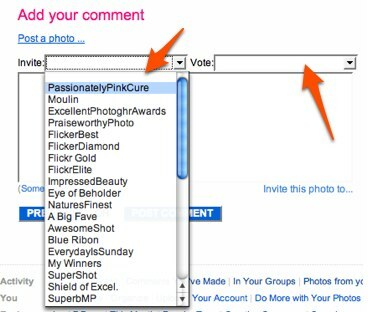 When installed, the script creates two drop down menus to post various Flickr group "invite" and "vote" html codes into photo comments. My script is based on the original SIC script, which I found it to be very helpful. Unfortunately, the script didn’t include some of my favorite group codes, and updates needed to be made to some of the existing group codes. So, I decided to edit the script to better fit my needs, adding more group codes and updating the existing ones. After testing it for a few weeks, I am ready to share it with other Flickr users. Which Flickr Group Codes are Included in the SOS Script? Installing Greasemonkey is as easy as installing any other Firefox extension. Click the "Install Now" button on the main Greasemonkey extension web page. Once Greasemonkey is installed, it should be fairly easy to install new scripts. Most times, just clicking on the script file will show the install window. Find many Greasemonkey scripts at Userscripts.org, but be aware that some scripts can be malicious, so be careful what you download. Download and install the SOS script by clicking on the link below. You must have the Greasemonkey Firefox extension installed before installing the SOS script. If you would like to view the script coding before installing, click on the button for “Show Script Source” from the install window. 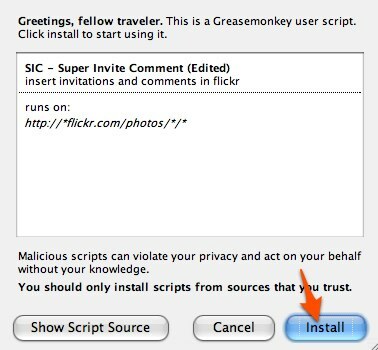 IMPORTANT: For those that are already using the original SIC (Super Invite Comments) greasemonkey script, it is your choice to disable or uninstall the script. If you choose to keep both scripts, both menus will display. 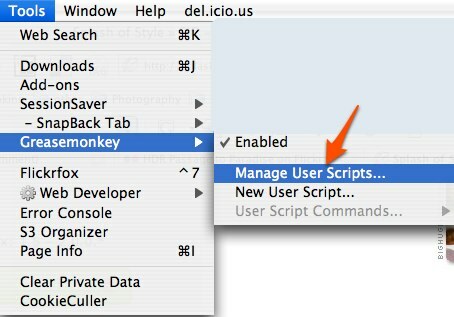 In the Firefox menu, click Tools>Greasemonkey>Manage User Scripts. Select the script from the left side column listing all installed scripts, then click the "Uninstall" button. If you don’t want to uninstall a script, but only disable it, UNCHECK the checkbox next to "Enabled". Keep an eye on this web page for updates! Version 0.21 = There was a little snafu with the award/voting coding for Super Shots. All fixed now. Version 0.20 = Removed Golden Photographer, Flickr Elite, Stock Shot, & Exemplary Shots codes. For those wanting the older version before these changes, I saved a copy of version 0.19 available for download. Version 0.17 = Decided to clean house and remove a bunch of group codes that I wasn’t using. I also added some new groups. Changes made: Updated the Creative Photo group to new award image & codes, Removed: Empyrean Flowers, Pritzker Prize, I Think This is Art, Instant Fave, Amateurs HiFive, Christmas 2007 group, Excellent Photographer Awards, Flickr Gold, Flickr’s Best. Added: Brilliant Eye Jewel, Citrit Group, Adorable Critters, Welcome To MyWorld, Stock Shot, Free Nature. NOTE: For those that want the previous version of the script without these new changes, I have saved a copy for you. Download the 0.16 version of the SOS script. Version 0.16 = There was an issue with the award graphic for the Golden Photographer group, and I fixed the html code in the script. Version 0.12 = Updated the html for Flickr’s Best. Also, very strange, I was looking at the codes, and I noticed that I didn’t remove the group PritzkerPrize, so it remains in the script. Version 0.10 = Updated the html for Better Than Good. Version 0.9 = Removed ISawYouFirst and PritzkerPrize groups. Version 0.8 = Removed the coding for the group “Eye of the Beholder” – it is purely a personal decision, as I feel that I cannot support this hypocritical unkind group. In its place, I have added the Golden Photographer. Version 0.7 = fixed a bunch of errors. I went over everything and I hope it is fine now. Version 0.6 = Added “Excellent Photographer Awards” for 1st, 2nd, and 3rd votes, Exemplary Shot invite & vote codes, Autumn/Fall invite & vote codes. Removed “Praiseworthy”, “People’s Choice”, “Take A Bow”, “World Through My Eyes” – and I cleaned up the code a lot, so if you find any errors, please let me know! Version 0.5 = Added “Better Than Good” invites and comment code. Version 0.4 = Added Macro Marvels, Best in Show (Dogs) & All You Need Is Love. Removed Moulin, Over the Excellence, and a bunch of the Scoring codes. Thank you to Santiago Caamaño(scaamanho) for authoring such a useful flickr script and for allowing me to edit and redistribute the script on my own! Have you tried updating the actual scripts themselves. I wouldn’t recommend going back to a prior version of Greasemonkey, only because they usually include security fixes. Try finding the scripts’ web page, or go to the flickr hacks group. Usually fixes are posted. Hola, j_limes me invito al grupo. iam hailey and i love this website. i hope we become friends…. Michelle, as stated at the beginning of this page, I am not updating the script any longer. Sorry! Good luck w/ the new groups! it’s so difficoul for me understand all that , speaking not well english, but a good iatalian language..but avent’ you an italian translation to send me? Vorrei creare un gruppo, ma non so come procedere! Qualcuno mi puo’ aiutare? Devo per forza scaricare Firefox? Under GNU General Public License, everyone is permitted to copy and distribute verbatim copies of this license document, but changing it is not allowed. Due to you are not updating this script any longer, may I add or remove groups and distribute for free these changes without violating this license. How can I do this?. Of course. You can make any changes to the script and redistribute it anyway you’d like. As said, I am not the original coder/author, so please keep his copyright & creator info intact. That’s all. I deleted GM because the script I used, not yours, was s..l..o..w…. Are there any scripts for safari? I have not bee to thrilled with firefox. If not: Does SICI , or SOS require to access your server? or are they installed on my computer? If so Can I access the script before I install it? Former coder. i like to check! Hello Lisi, no GM scripts are installed on your server; they are all saved on your hard drive in your Firefox profile. Hi there, Debbie! I’m having a problem. After downloading Firefox and GM, all I have are empty boxes labeled “Manage User Script”? Is there something else I should be doing? Thanks! Aisling, did you install Greasemonkey? Directions are in the article above. I did install it, but the drop-down boxes aren’t appearing. So, you installed Greasemonkey, and then installed the SoS script? If you did all that, then I really have no idea what is causing an error. I am not that familiar with the scripts anymore, I stopped working with it a long time ago. I am sorry! Good luck! Dear Debbie, The system is working fine now and I just want to thank you for all your help! Two thumbs-up!! Glad to hear it! Enjoy Flickr!